With AUTOi you can set trade alerts so that you never miss a listing and get new listings that match your preferences emailed straight to you. You can enter up to 3 email address for people you want to be alerted about matching stock. You can filter alerts by Vehicle Age, Vehicle Mileage and Vehicle Distance if you only want alerts for cars within a certain radius of you and to do this just use the drop down menus. 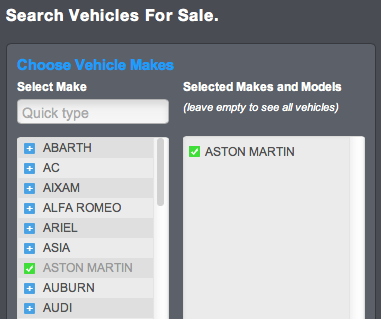 Choose Vehicle Makes - When your search page is fully expanded you can add which makes you want to view. To do this just press the blue (+) sign next to the Make of vehicle and it will move to the box on the right and will appear with a green tick next to it. Use the slider to the right of the Makes to scroll up and down and select as many Makes as you want. Above this list of makes you can free type in a quick search in order to find your desired Make. If you don't select any Makes then when you perform a search everything available for sale will be displayed. To remove a Make that you have selected just press the green tick button next to the Make on the right hand column and it will be removed. Choose Vehicle Models - When the Make has been selected and appears in the right hand column press to the right of the Make and a new window appears as shown here. You can then refine your search criteria and select the particular Models that you want to see that are associated with that Make. When selected the Models will appear with a green tick. 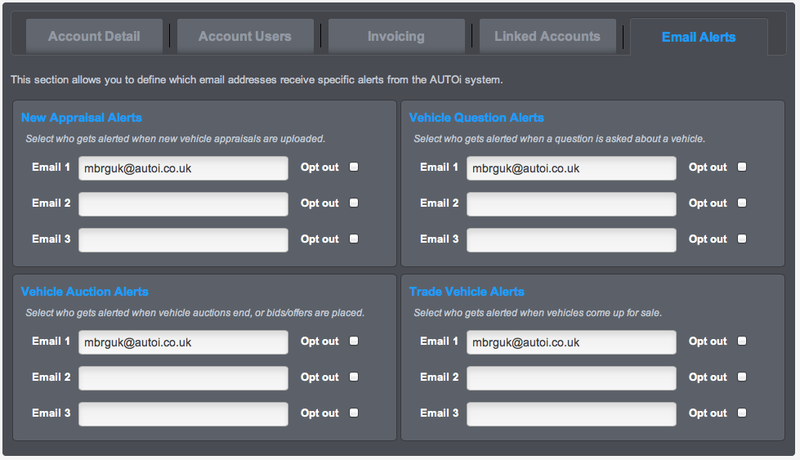 Vehicle alerts will be emailed directly to you and look like the example above. The alerts will detail the listing type, price, end time and date and vehicle information. 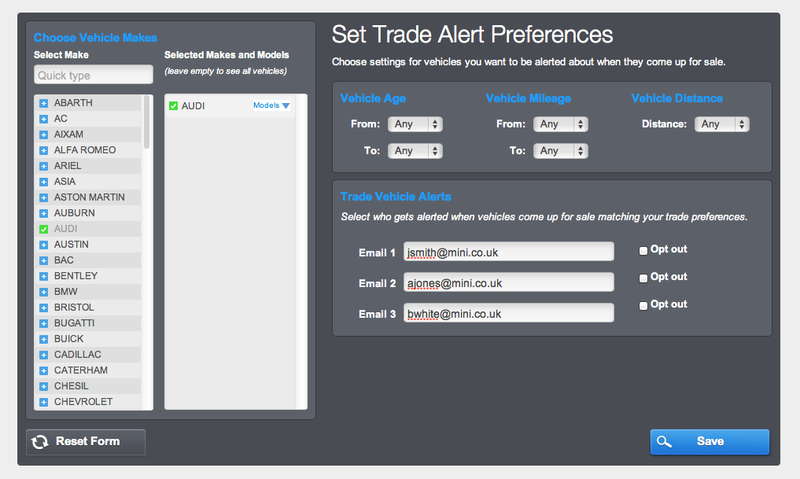 From the email alert you can select to view the full details and you will be taken directly to the vehicle listing in AUTOi. You can also select to change and amend your vehicle alerts. AUTOi online systems come with an intelligent address book that allows you to create groups of peolpe to mail out your digital appraisals to. The address book has an import feature to sync all your existing contacts into your AUTOi online system. Just export from your current mail box and import straight into AUTOi. Add Entry - To do this just press the add entry button and a new screen will appear as shown below. 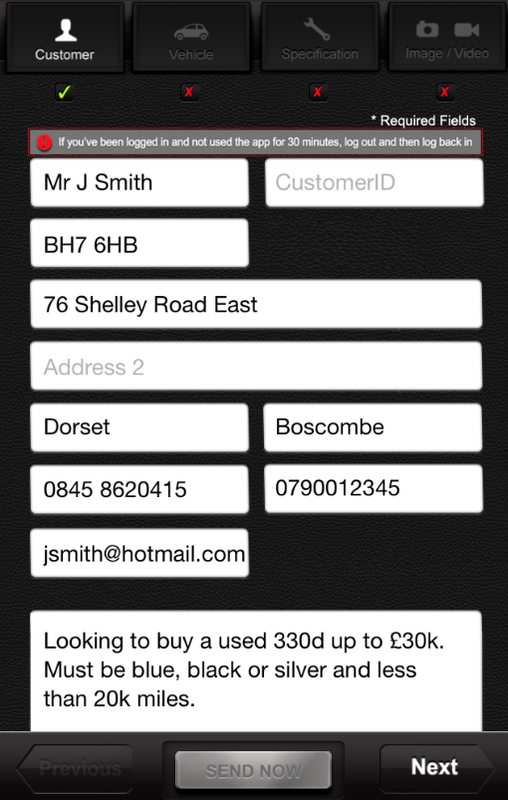 Add in your contacts Name and Email with optional boxes to add in Phone Number and Dealership. If you have set up Groups in your address book you can also add them to your chosen group at this point. Finally add in any notes about this individual and press add entry. 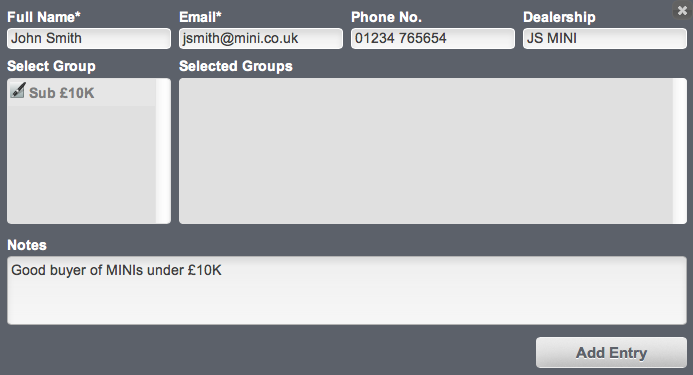 Add Group - To add groups to your address book just press the 'Groups' tab and a new window will pop up as shown below. All you need to do is add in a 'Group Name' and then enter any notes in 'Group Notes'. When you're done just press the 'Add Group' button and you're all done. Anytime you buy or sell through AUTOi both buyer and seller invoices are automatically generated and emailed within 5 minutes of the sale ending. AUTOi will also store all copies of your invoices under 'Invoice History' so that you can refer back to them whenever needed. To view an invoice just press the red PDF symbol and invoice number and a PDF invoice will open up. 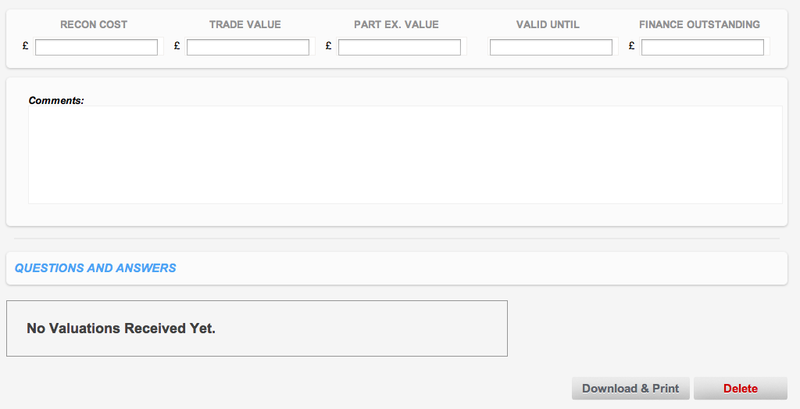 You can also sort your invoices buy newest / oldest first or choose from a date range. With HPI integrated into your AUTOi account you can conduct provenance checks and valuations on appraisals and also when looking to buy a vehicle at auction. Any checks you carry out will be archived and can be accessed from 'HPI Lookup History'. In the overview show below you can see the Reg Number, Type, Date and which products were selected. To view the full information on the check press the red 'View' button and a PDF will open with the original HPI check information. 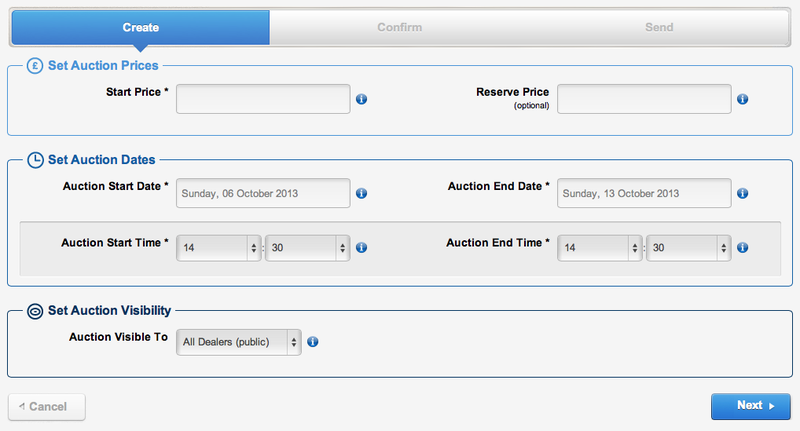 In feedback history you can view all feedback left by buyers of your sold vehicles. The first box 'Feedback Ratings' shows whether buyers rated their experience with you as Positive, Neutral or Negative. 'Detailed ratings' is displayed on a 5 start scale and highlights how sellers felt about your vehicle descriptions, the quality of your communication and issue resolution if there was any. The box at the bottom of the page displays any comments left by buyers about their experience in dealing with you. Account Settings - This section contains everything you need to know about configuring all your AUTOi settings. All settings sections run across the top and your selected choice is highlighted blue. To move between the various sections press the appropriate tab. 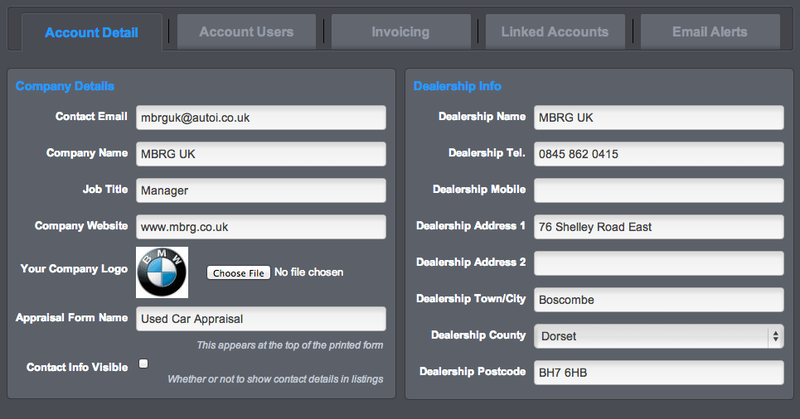 Account Detail - The first section contains all your dealerships information and your main user details. To change any of the information just type into the white boxes and when you're done press the save button. Account Users - This screen gives you an overview of all your account users, display names, passwords and login information. This section also allows you to ‘Add Users’ and ‘Edit’ Users. Note - For security reasons passwords are hidden so if you want to reveal them you need to press the padlock symbol next to 'Password'. This will then bring up a new box, enter your password and it will then reveal all passwords. Adding or Edit User - To add a new user press the ‘Add User’ button and a new screen will open. 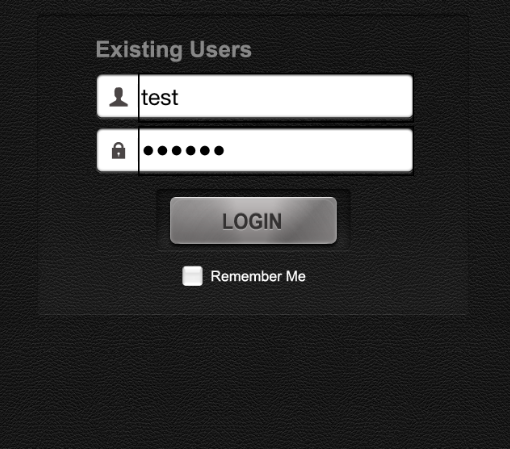 The login name will be automatically generated and you can then allocate a password and user display name. Permissions can then be set up for both desktop access and mobile access. For each sub category select either No Access, View Only or Full Access for the desktop options and either No Access or Full Access for appraisal app permissions. Note - View Only access allows users to view information only where as Full Access allows users to execute commands and edit data. To Edit a Users settings press the ‘Edit User’ button and reconfigure their settings, including the option to remove the user. Invoicing - When buying or selling through AUTOi, the system will automatically email out PDF buyer and seller invoices. To customise the details that you want to appear on these invoices fill in the white boxes and include everything from your invoicing address to Vat & Company No. As a seller there is an additional box to enter in your payment advise so you can let buyers know how you want to be paid and where to send the money. 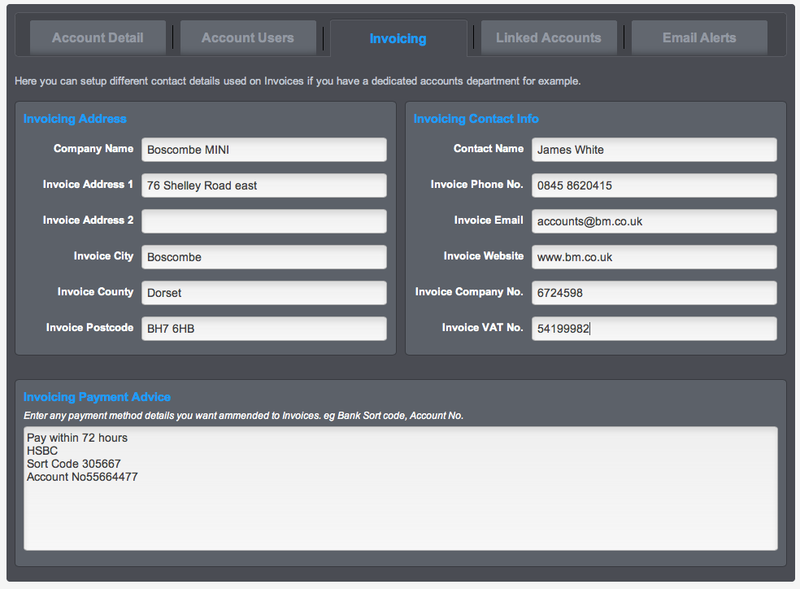 Linked Accounts - If you have an account with HPI integration you'll find your HPI details in this section. If you change your HPI password or username you will need to update them in this section otherwise HPI integration will stop working. Email Alerts - You can set various email alerts so that particular people in your business get notified when New Appraisals are uploaded from the mobile apps, If anyone asks you a question about a car for sale, trade alerts for notifications on vehicles being entered for sale that meet your criteria and also Vehicle Auction alerts which tell you as soon as a car is sold. You can add up to three different email address and if you ever go on holiday and want to pause your alerts just tick the 'Opt Out' box. When you have made all your changes just press save. When you access the app the first screen you are taken to is the login screen where you need to enter your unique Username and Password. If you are using the app from a private device you may wish to tick 'Remember Me' so that your login details are stored so you wont have to keep re entering them. 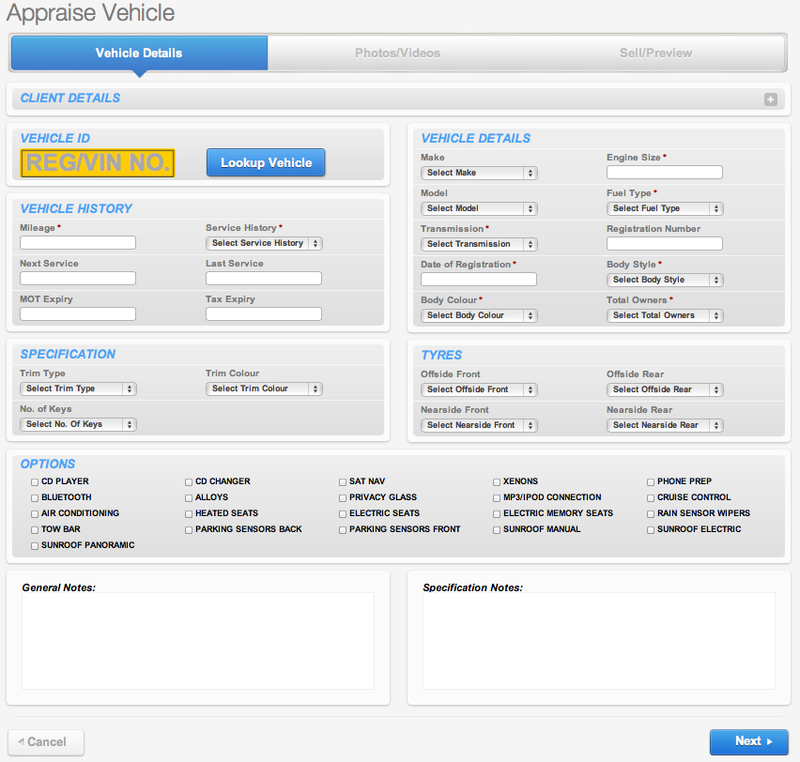 Once logged in you have two options either 'ADD VEHICLES' to start a new appraisal or 'PENDING VEHICLES' to retrieve a previously saved appraisal. There is also a 'LOGOUT' button to log you out of the app. Customer - the first section of the app is the customer section where you can capture all your customers details. The customer section allows you to record the customers name, address, customer ID, mobile, landline and email address. There is also a section at the bottom for entering any customer notes. Once you have finished entering all your customer details just press the 'Next' button at the bottom right of the app and you can progress to the next section. Note - you will notice on this screen there is a warning message that asks you to log out and then log back in if you have been logged in and not used the app for 30 minutes. This is for security purposes as if your device gets lost or stolen, sensitive information can not be retrieved unless the user goes back through the login process. 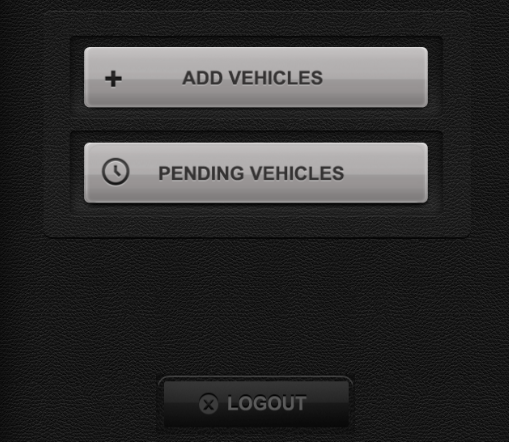 Vehicle - the second section of the app takes you to the vehicle section. First of all enter the vehicles registration number into the yellow box marked 'REG NUMBER' and then press the blue button marked 'LOOK UP VRM'. This will then preform a VRM check and populate the 9 boxes marked with a blue border with all the vehicles information. Once you have completed a VRM continue to enter the vehicles mileage and then using the drop down boxes enter, No of Keys, Service History, Next Service, Last Service, Tax Expiry and MOT Expiry. When you have entered all vehicle information press the 'Next' button at the bottom right of the app and move to the next section. Tip - If you enter the incorrect Reg Number just press the button shown here to re set all the VRM fields and start again. Specification - the third section of the app allows you to enter specification information. Start by entering the vehicles Trim Colour and Trim Type. To do this just use the drop down menus and choose your options and then press 'Select'. Then move on and enter any options the vehicle may have by pressing the white boxes next to the option names. When selected the box appears with a blue cross. To deselect an option press it again and it will remove the selection. 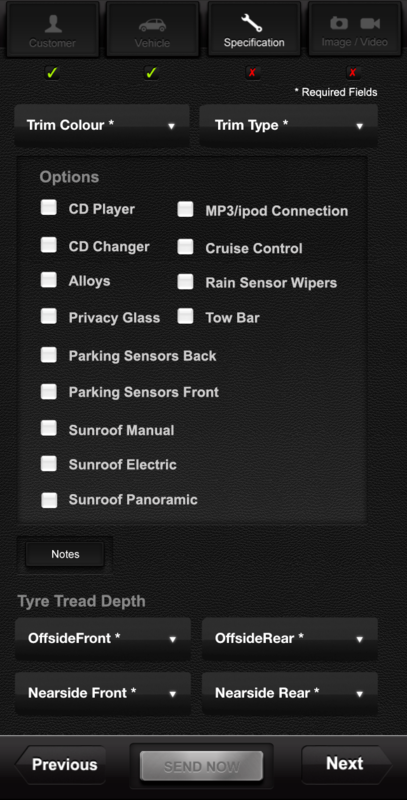 If you want to type in your own vehicle specific options use the notes box and free type in the options. Finally at the bottom of this section you can enter in the tyre depths. To do this just use the drop down menus and select the tyre depths. Once complete press the 'Next' button in the bottom right of the app and progress to the next stage. 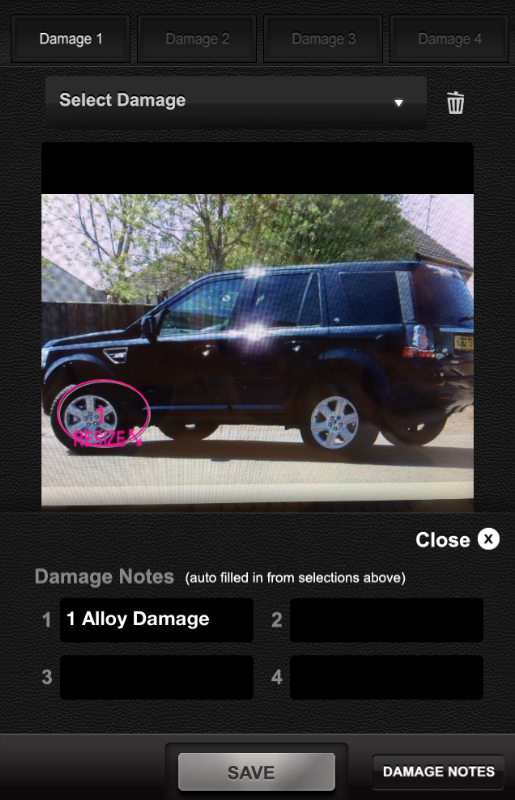 Image / Video - The final section of the app allows you to take up to 9 photos, 2, 2 minute long videos, general notes about the condition of the car and the ablitiy to add damage markings directly onto the photos you take. Photos - to take a photo start with the first photo slot marked (Main Image) and press +ADD. This will then open up your devices camera and you can take a photo in both landscape and portrait mode. Start at the front of the vehicle and work your way round taking pictures of the front profile, near side, rear, off side, interior, alloys and any other points that will be useful to build up a detailed profile of the vehicle. 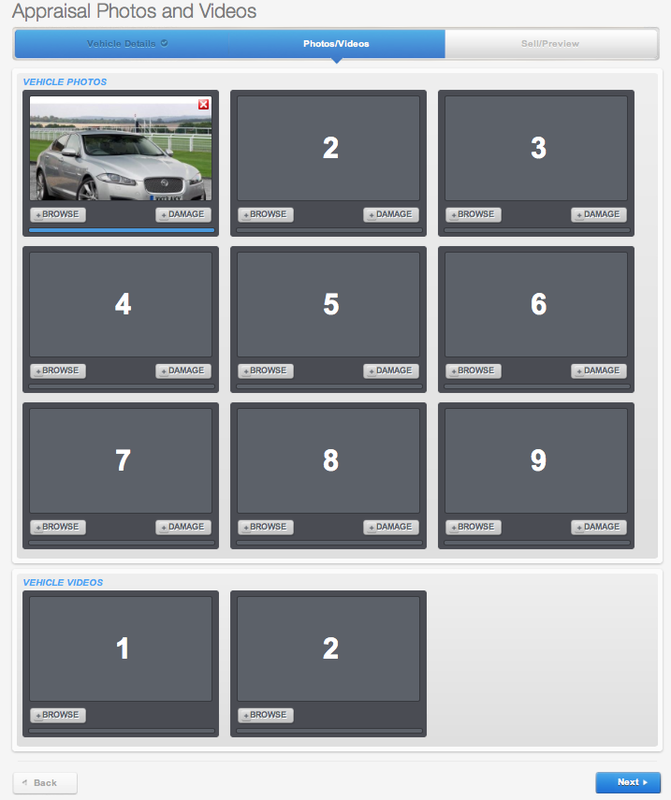 Video - a really simple and effective way to appraise a vehicle is to use the video function of the app. Just press +ADD in the video slots and the devices video recorder will come up. Press record and then walk round the vehicle describing the condition. When you're done press the stop button and your video will be saved. Photo Detail - to add in damage markings to photos you have taken just press the 'Detail'button under the photo and a new screen appears as shown here. You can add up to four damage markings per photo and to scroll between them just select Damage 1 - 4 at the top of the screen. Then just press 'Select Damage' and a drop down menu will appear. 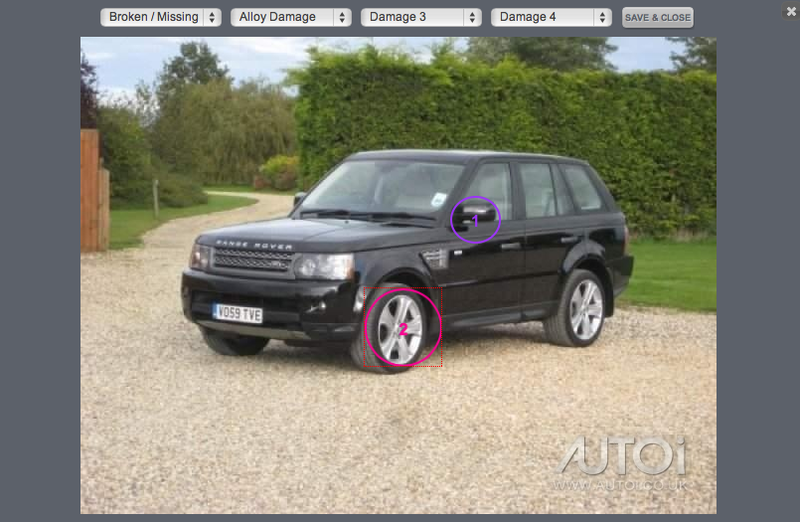 Select the type of damage you require and a coloured circle will appear in the centre of the photo. Press the coloured circle and it will start to flash, you can then drag it into place and cover the area of damage you wish to highlight. Press the circle again to stop it flashing and now you can 'RESIZE' the circle. To resize the image just drag the arrows in or out and it will change shape. To check what markings you have placed on the photo just press the 'Damage Notes' button at the bottom right of the screen. To delete a marking just select it and press the Trash Can sysmbol and it will remove it. When you're done press 'Save' and you will return to the Image / Video section. You will notice that when you have added damage markings to a photo the word 'Detail' under the photo will change to green with a tick next to it. Finally when you are done and have four green ticks just press the 'Send Now' button at the bottom of the screen and your appraisal will be sent over WiFi or 3G to your AUTOi VMS system. If you don't have access to a compatible Apple or Android device or you already have all your vehicles imagery you can create an appraisal using our desktop 'Create' appraisal tool. 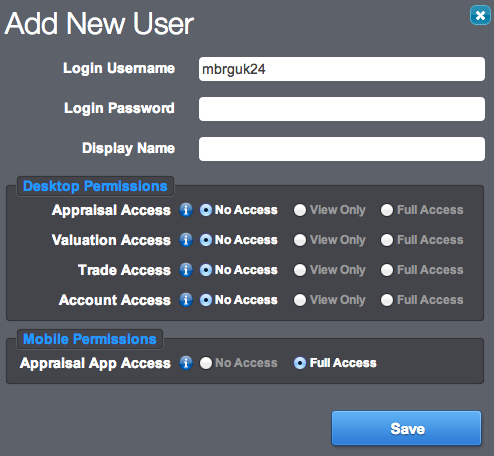 Everything that can be done in the mobile appraisal apps can be done on the desktop version. To start you can add in optional 'Client Details' by pressing '+' symbol to the right of the client details box and from there enter in anything from your customers name and address to contact numbers and email. Vehicle ID - To preform a VRM enter either the vehicles reg number or vin number into the yellow box and press the blue 'Lookup Vehicle' button. This will then populate all the boxes in the 'Vehicle Details' box on the right hand side. If any information is missing from the VRM check just select the empty fields and use the drop down menus to complete them. 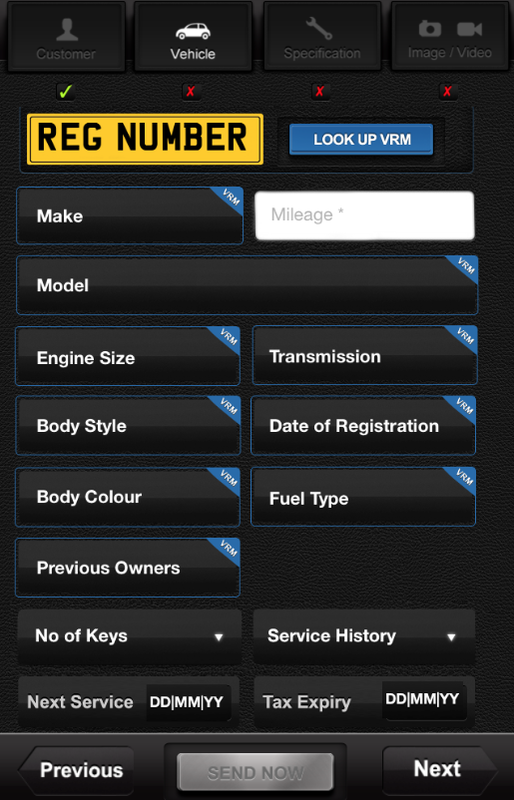 Having done the VRM check you can move on and complete the 'Vehicle History', 'Specification', 'Tyres' and 'Options' boxes. To complete these boxes just use the drop down menus and select from the lists, free type in the mileage, use the calendars to enter in dates and tick the boxes for the options. Finally add in 'General Notes' to highlight an overall assessment of the vehicles condition and enter in any 'Specification Notes' of specific options the vehicle has over an above the standard option boxes. When you're done press the blue 'Next' button at the bottom right of the page and move to the next section. Photos/Videos - when you select this you will be taken to a new screen as shown above. Here you can add or remove images and also add additonal damage markers to pictures you have captured. To add a new photo or video you can do one of three things, either press the grey 'Browse' button and search your PC, Tablet or Smartphones library and upload the photo, or from a desktop PC/Mac just drag the image from your computer and drop onto the photo slot where you want the image to appear. If you are editing/adding media from a tablet or smartphone you can take a new photo or video using the devices camera and it will automatically upload. Tip - When uploading a video there is a maximum file size which is 10MB or approximatly 2 minutes of video. Add Damage - to add damage markings to photos just press the grey 'Damage' button and a new screen will appear as shown above. You can add up to 4 damage markings per photo and to add it, select from one of the four tabs at the top of the page and a drop down menu will appear. When the type of damage is selected a coloured circle appears on screen, just drag it and place it over the area of damage. You can re size the damage circle by dragging the arrow at the bottom left of the circle. When you're done just press 'Save & Close' and all changes made will be saved. Finally once you have completed the appraisal you can choose to 'Sell Now' and list your car at a Fixed Price or a Standard Auction (for more information on selling please view the selling section of our help guides)or you can 'View' your appraisal or return to your inbox. Photos, Videos & Damage - running across the top of the vehicle image are tabs to scroll between photos, videos & damage. Under the photos are any damage descriptions associated with the particular image. Photos automatically rotate but pressing the arrows to the centre left and right of the image will allow you to scroll through them. Vehicle Details - the top right blue box is the details returned from the VRM check. If any information is incorrect pressing the drop down menu will allow you to change them. Grey Boxes - it you want to ammend any information in these boxes just use the drop down menus or tick and untick the check boxes. General Notes / Specification Notes - these boxes contain any information entered during the appraisal and can be edited by typing in the box. Save - when you make any changes to the appraisal a yellow save button appears in the centre of the screen. This button must be pressed to save any changes made. Edit Media - when you select this you will be taken to a new screen as shown above. Here you can add or remove images and also add additonal damage markers to pictures you have captured. To add a new photo or video you can do one of three things, either press the grey 'Browse' button and search your PC, Tablet or Smartphones library and upload the photo, or from a desktop PC/Mac just drag the image from your computer and drop onto the photo slot where you want the image to appear. If you are editing media from a tablet or smartphone you can take a new photo or video using the devices camera and it will automatically upload. Send Link - AUTOi allows you to send your digital vehicle appraisals to anyone with an email address, so whether you want to send it to a trader for a valuation, body shop for an estimate on the damage or to a customer to pre sell a retailable part exchange you can. Select Contacts - on the left side you can either select 'Individuals' or 'Groups' (more about Individuals and Groups can be found under Help>Settings>Address Book). Select who you want to send the link to and then press the '>>' in the centre column and contact will move to the right hand box. Request - under to contact boxes select either 'Request Valuation' or Request Other'. Selcting request valuation will allow the recipient to enter a valuation on your appraisal. Selecting request other will allow you to type in a message. When you're done just press 'Send' and an email will be sent to the recipients containing a link where they can then view your appraisal and either enter a valuation or responed to the message you just sent them. 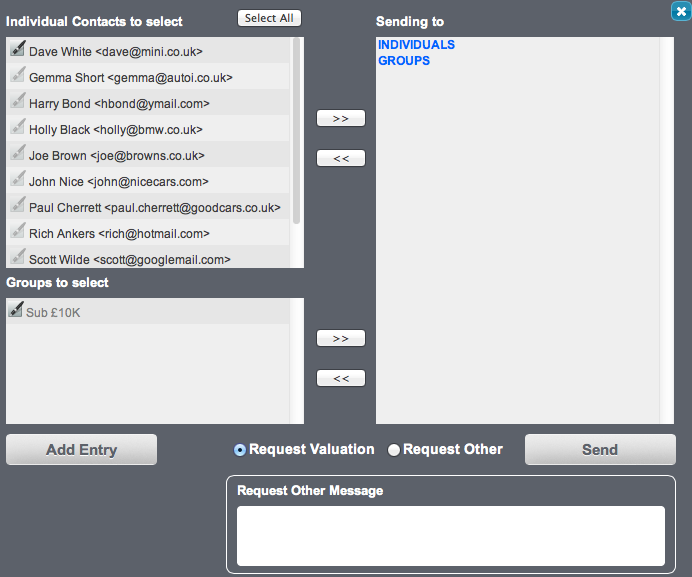 Add Entry - from the send link screen you can add a new entry if you have not already added them to your address book. To do this just press the add entry button and a new screen will appear as shown below. 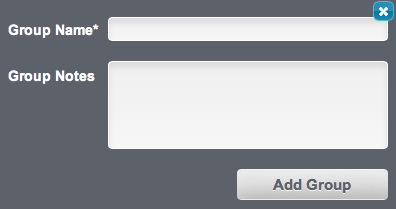 Add in your contacts Name and Email with optional boxes to add in Phone Number and Dealership. If you have set up Groups in your address book you can also add them to your chosen group at this point. Finally add in any notes about this individual and press add entry. Action - when you roll over the action tab various options are displayed and you can then add your appraisal to one of three sections of your archive. You can also delete the appraisal from the action tab, however be careful when deleting as it will permanently remove the appraisal any any data associated with it. Tip - keep your inbox tidy and easy searchable by archiving appraisals. HPI Check & Value - if you have a HPI account we can integrate this into your AUTOi account. In order to run a check just select whether you want to run a HPI Check or an ID Check followed by all or any of the following products Glass's Valuation, Cap Black Book +, Cap Valuation, Spec Check or NMR Check. When you have selected the appropriate options just press the Check button and the results will display below. View past lookups for this VRM - if you have already run previous checks on a vehicle and want to see what they were just press the blue 'view past lookups for this VRM' word and the history of your checks will be displayed below. Select the search you want to see and press the 'View' button and the results will populate below. Note - HPI Products will be charged at your current HPI rate and/or count towards your monthly allowance as appropriate. Download & Print - press this button to download and print a copy of your appraisal which you can get your customers to sign or to be placed into the deal file. When downloaded your appraisal appears as a PDF and from there you can print it. Downloading and printing can be conducted from within the 'View & Edit' screen and pricing information and customer comments can be added as shown in the image above. Deleting an appraisal can also be done from this screen. Delete - to delete an appraisal just roll over the action button and press the red 'Delete' button. Deleting an appraisal can be completed from within 'View & Edit' and is located at the bottom of the appraisal as shown below. 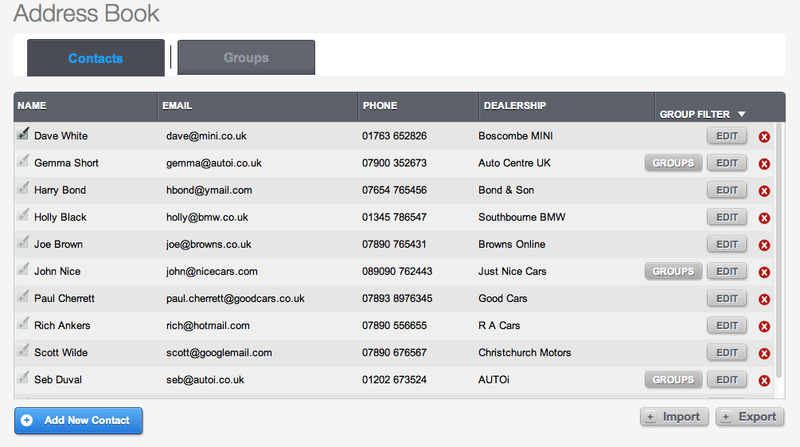 Inbox Search - The grey box at the top of the page is a search box and allows you to search your inbox for appraisals buy a number of attributes from Make and Model to Customer Name or Reg Number. Once you have refined your search attributes just press the blue 'Search' button. Alternatively if you want to clear your search just press the 'Reset Form' button. Inbox List - Under the search box is the list of all your appraisals contained within the inbox and are listed in chronological order with the most recent first. Next to each appraisal are four boxes 'View & Edit' to view and edit your appraisals, 'Send Link' so that you can email your digital appraisals, 'Sell' which allows you to send appraisals into auction and 'Action' to move appraisals to your archive or to delete them permanently. Archive - is where you need to send all appraisals that don't require any further action at that particular time and allows you to keep your inbox nice and tidy. Archive Search - The grey box at the top of the page is a search box and allows you to search your archive for appraisals by a number of attributes from Make and Model to Customer Name or Reg Number. Once you have refined your search attributes just press the blue 'Search' button. Alternatively if you want to clear your search just press the 'Reset Form' button. Tip - used effectivly your archive is a great prospecting tool as it allows you to re visit part exchange appraisals that didn't get dealt on first time round. When you are short of stock or have a customer looking for a particular car that you havent got, seacrh your archive and see if you can get a double deal done. How long does it take to send an appraisal from the AUTOi app? What’s quicker, sending over Wi-Fi or 3G? How many free AUTOi apps can one user download? Our dealership has only one device to conduct appraisals with, can multiple users use this one device? We have compatible Apple and/or Android devices in use at our dealership, can we download the AUTOi App to those devices? Can I send my digital appraisal to people without an AUTOi account? Can I access my AUTOi account from any smartphone, tablet, mac and pc? Can the people I send my appraisal to, see sensitive information? What is a compatible Apple device? What is a compatible Android device? What browser do I need in order to use the website? From my IOS (Apple) device and using Safari I have selected 'remember me' but it doesn't save. How can I get this to work? Sometimes when I try to complete a VRM in the app I get the following message (......Please try again later) why is this? At my dealership we struggle to get a good WiFi signal on our forecourt / car park will this affect the performance of the app? Is a Free Buyers account really free? Are there any catches on the 30 day free trial? This depends on your Internet speed. Most dealers can send a complete appraisal with 9 photos in under 60 seconds. This depends on your service provider but generally 3G is quicker. However be careful, as there are often data costs with 3G so check with your provider. A user can download as many free AUTOi apps as they like. So for example a user can download the AUTOi app to their iPhone, iPod touch and iPad and can then login and use which ever one is more convenient. Yes multiple users can use one device. All they need to do is login using their unique username and password. Yes you can. You can download the AUTOi App to any compatible device for free. Yes you can. You can send the appraisal to anyone with an email account. Yes you can. 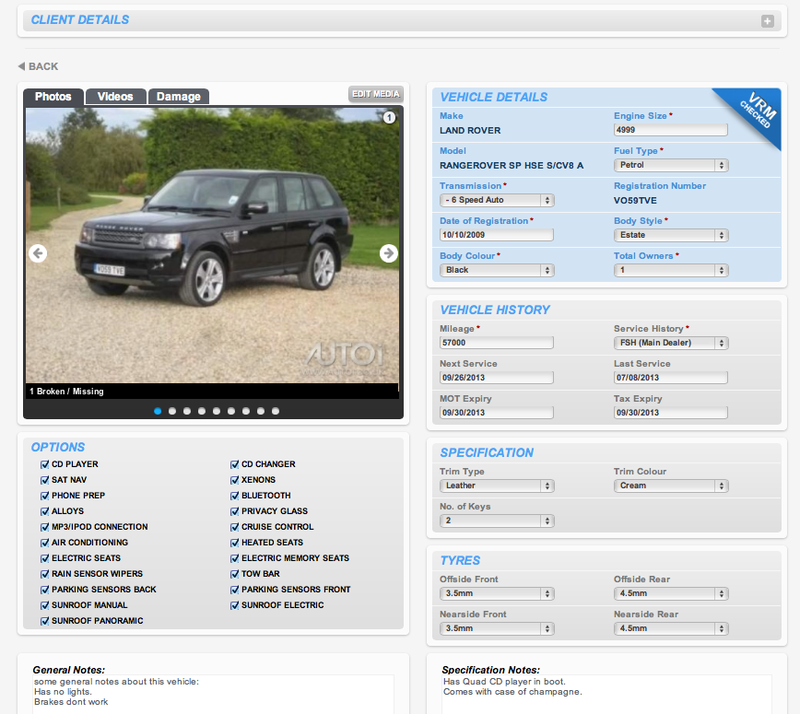 Convenience is at the heart of AUTOi and can be accessed from just about any smartphone, tablet, mac or pc. No they can't. Any customer details and pricing information is omitted prior to sending. The AUTOi app can be used on iPhone 3GS/4/4S/5, iPod Touch 3rd/4th/5th generation, iPad and requires iOS 5.0 or later. The AUTOi app can be used on most Android devices running an operating system of Gingerbread 2.3 or later and is optimised for use on Jelly Bean 4.1 or later. AUTOi supports all major browsers (Internet Explorer, Google Chrome, Safari and Firefox) and requires the latest version e.g Internet Explorer 9. If your browser is out of date just update to the latest version for free. 'Remember Me' is a browser supported option and so to activate it you will need to do the following from your mobile device go to - Settings > Safari > Private Broswing > Be sure this is switched OFF. And turn on AutoFill. This generally occurs if you have a weak signal. Make sure you have good WiFi/3G coverage when completing a VRM request within the app. No. The app only needs WiFi in three places. 1) To login to the app, 2) To complete a VRM and 3) To send. So best practice is to login and complete a VRM in the showroom with good WiFi, then conduct the appraisal outside with no/low WiFi and then send when back in the showroom with good WiFi. Yes it is completely free to register for a buyers account which gives you access to all vehicles available for sale in auction. If you complete a purchase then there is a £20+Vat purchasers fee, but this is only applicable if you purchase a vehicle. No the 30 day free trial is totally free with the exception of any purchases made will be subject to a £20+Vat purchase fee. 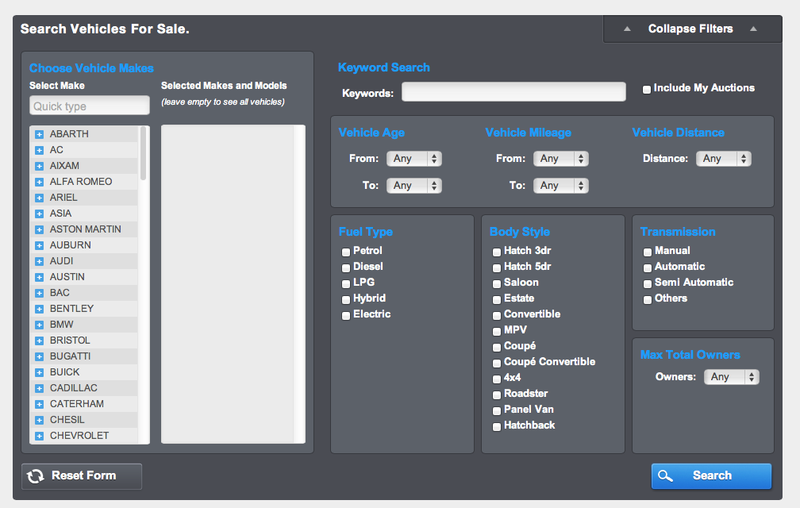 Search Vehicles For Sale - to begin a search for specific cars for sale just press the button marked 'Expand Filters' and a new menu will appear as shown below. When conducting a detailed search you can filter what you see by Fuel Type and Body Style to Vehicle Age and Total Owners. Just use the drop down menus or tick boxes to refine your search. If you don't select any Makes then when you preform a search everything available for sale will be dsiplayed. Choose Vehicle Models - When the Make has been selected and appears in the right hand column press to the right of the Make on a new window appears as shown here. You can then refine your search criteria and select the particluar Models that you want to see that are associated with that Make. When selcted the Models will appear with a green tick. Once you have finished adjusting your search criteria press the blue search button and your results will be displayed. Alternativly press the 'Reset Form' button to clear the search and start again. Under each image on the left side of the listing, symbols highlight how many photos and videos the listing contains and also how many peolpe are watching it. 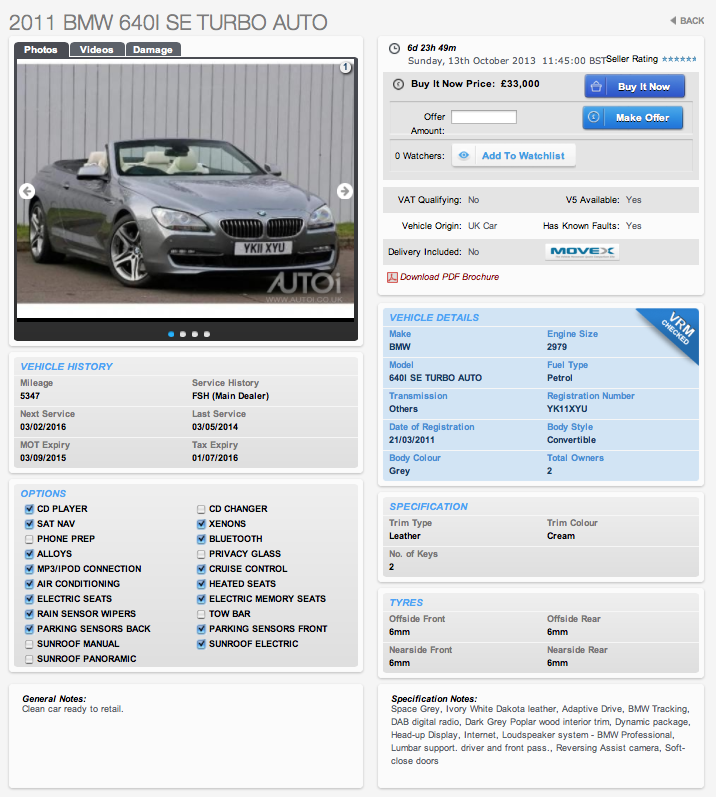 The main body of the listing displays key vehicle information and the selling dealers seller rating. To the right of the listing you can find the current price, the type of sale, when the listing ends and how many bids each has. Press the 'Watch' button to add the listing to your watchlist or 'Un-Watch' to remove it from your watch list. 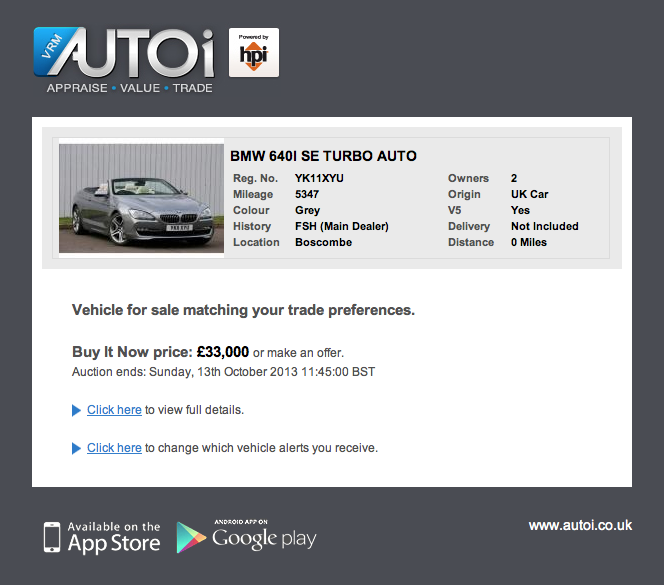 Select 'View & Bid' to see the full appraisal and bid. Vehicle Details - the blue VRM box contains all the vehicles details. Grey Boxes - contain additional vehicle information for Vehicle History, Speciification, Tyre Depths and Options. General Notes / Specification Notes - these boxes contain any other additional information entered by the seller. Download PDF Brochure - select this to download the listing as a PDF and send to a potential customer. Buy It Now / Make Offer - the top left of this box displays how long the listing has left and when the listing is due to finish and to the right you can see the seller rating. The buy it now price is listed and if you want to buy it just press the 'Buy It Now' button. If the seller is happy to accept offers you can enter your offer in the 'Offer Amount' box and then press 'Make Offer' to submit your offer. Having pressed the 'Buy It Now' or 'Make Offer' button you will get a confirmation box appear to confirm if you are happy to proceed. Auction - the top left of this box displays how long the listing has left and when the listing is due to finish and to the right you can see the seller rating. If you press the seller rating a new window will display with the sellers contact details. The 'Current Bid' or 'Starting Price' is displayed and if the reserve has been met the text will be highlighted blue and if the reserve is not met the text will be in red. 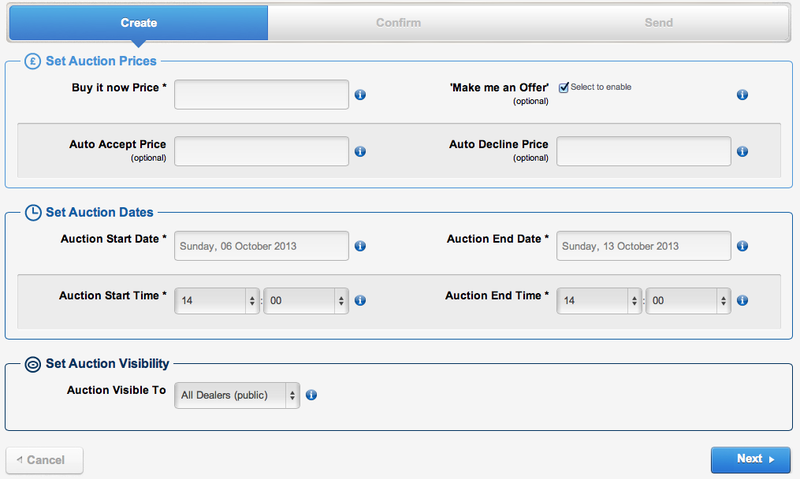 When you bid at auction you can enter in 'Your max bid' and let the system bid on your behalf. When making a max bid the system will enter your opening bid at the reserve price if your max bid is greater or equal to the reserve price. Bidding incraments are set at a £100 minimum up until the last 12 hours of an auction when incraments are a minimum of £50. You can view bidding history of the listing by pressing 'View Bidding History'. HPI Check & Value - if you have a HPI account we can integrate this into your AUTOi account and then allow you to run provenance checks and valuations on cars that are advertised for sale. In order to run a check just select whether you want to run a HPI Check or an ID Check followed by all or any of the following products Glass's Valuation, Cap Black Book +, Cap Valuation, Spec Check or NMR Check. When you have selected the appropriate options just press the Check button and the results will display below. When you buy anything an electronic sellers invoice will be emailed to you within 5 minutes of winning and details all the sellers contact details so that you can make arrangements to collect and pay for the car. All details of your purchase's can also be found in your bought list and from here you can 'View Invoice' and 'Leave Feedback' if you want to rate the seller and 'View Feedback' if you have already left feedback on the seller. The listings will also show you when the listing ended, what your winning bid was and also the bidding history if it was an auction listing. Your 'Watch List' contains all the vehicles you have selected to watch and gives you an overview of current pricing, listing times, bids and whether you have the highest current price. To remove a vehicle from your watch list just press 'Un-Watch' button and it will be removed. Your 'Bidding List' contains all the vehicles you have bid on and gives you an overview of current pricing, listing times, bids and whether you have the highest current price. If you have made a bid on a 'Make Offer' listing, selecting 'More Options' will reveal your bid and if it was rejected you can find out why the seller rejected it. With AUTOi you can set trade alerts so that you never miss a listing and get new listings that match your preferences emailed straight to you. You can enter up to 3 email address for peolpe you want to be alerted about matching stock. You can filter alerts by Vehicle Age, Vehicle Mileage and Vehicle Distance if you only want alerts for cars within a certain radius of you and to do this just use the drop down menus. Sell - to sell a vehicle roll over the 'Trade' button and select whether you want to list the vehicle at a Fixed Price or a Standard Auction. If you have already listed a vehicle for sale and it ended unsuccessfully you will also have the option to Re-List. Fixed Price / Buy It Now / Make Offer - if you choose to sell at a Fixed Price you will be taken to the screen shown above. Start by entering the Buy It Now price. Additionally you can enter a Make me an Offer option which invites buyers to make you an offer which you can review and accept or decline. If you decide to include offers you can also set an 'Auto Accept Price' and 'Auto Decline Price'. For example you may decide that your fixed price is £10,000 however you may wish to consider all offers above £9,500. By placing an Auto Decline price of £9,500 anyone who makes you an offer of equal to or below £9,500 will have an automatic notification that you will reject the bid. Anything bids above £9,500 will be emailed to you for you to consider and accept or decline as appropriate. With your pricing set you can then set the Start Date & Time and the end Date & Time. Minimum duration of a listing is 24 hours and a maximum of 28 days, however you can re-list if the vehicle fails to sell in the given time period. You can also schedule listings to start in the future so for example you could set up all your listings on a Friday afternoon and set them to go live on Monday morning. When you have entered all price and date information press the blue next button and progress to the next screen. The last screen is an overview of all the listing information entered, check you are happy with it and then 'Send Live'. When you sell anything an electronic sellers/buyers invoice will be emailed to you within 5 minutes of selling and details all the buyers contact details so that they can make arrangements to collect and pay for the car. All details of your sales can also be found in your sold list and from here you can 'View Invoice' and 'View' to view the original listing. The listings will also show you when the listing ended, what your winning bid was and also the bidding history if it was an auction listing. 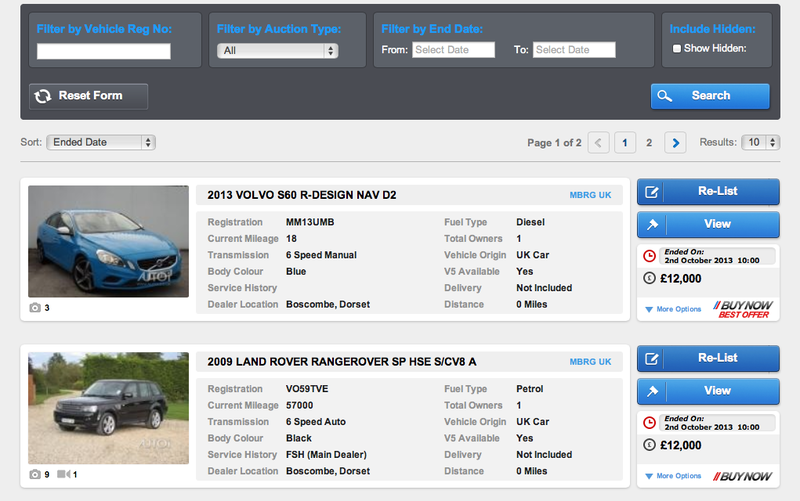 You can also use the filter at the top of your sold list to search for particular vehicles you sold by Reg Number, Auction Type, and Date Range. If your vehicle fails to sell a copy of it will appear in your Un Sold List and from here you can 'Re-List' and 'View' to view the original listing. The listings will also show you when the listing ended, what the highest offer was and also the bidding history if it was an auction listing. 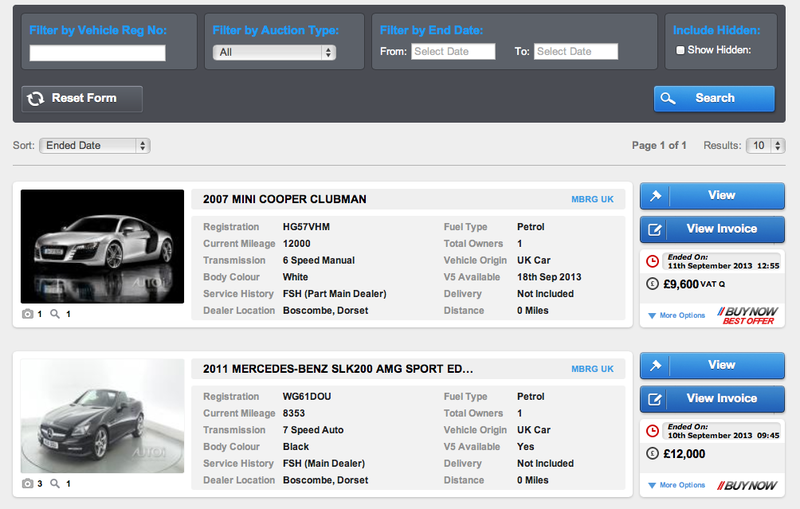 You can also use the filter at the top of your un sold list to search for particular vehicles by Reg Number, Auction Type, and Date Range.